The Family Medicine Certification process, provided by the American Board of Family Medicine (ABFM), is the means by which the ABFM continually assesses its Diplomates. Virtual KSA (held each fall). This training, once fully completed, will qualify for an ABFM performance improvement activity. This unique, two-part program is the perfect opportunity to take part in a quality improvement project to increase colorectal cancer screening (CRC) rates in your practice. Sixteen (16) practice team will meet outside their normal office setting to hear from expert speakers on best practices in screening protocols, up-to-date guidelines, and the importance of QI in patient care and population health as a whole. Participants will use an online module to measure their team engagement, benchmark patient data, select an intervention for care delivery, and remeasure outcome data after a six-month change period. Not only is this training free, once all the data is collected and the credits reported, we’ll send each team a $250 stipend! Learn more and secure a spot, visit the training’s web page. The AAFP and the OAFP continue to represent the needs of our family physician members as we work alongside the ABFM to improve processes and communication. In the fall of 2018, we were pleased to share that after diligently collecting and listening to member feedback, accepting the AAFP’s rigorous report recommending needed improvements for continuing certification, the ABFM is making changes. Read “ABFM Announces New Leadership, Programs, and Solutions to Help Alleviate Administrative Burdens” from the winter 2018 issue of The Ohio Family Physician to learn more and read on for additional information on new ABFM initiatives. Continued improvement in clinical practice is a critical hallmark of the commitment family physicians make to ensure they are providing the highest quality care to patients. Did you know that physicians can claim performance improvement (PI) credit for quality improvement (QI) activities that they are already doing in their daily work? It’s called the Self-Directed Performance Improvement Pathway and it’s a terrific way for physician practices of all types and sizes, even the most non-traditional, to capture credit for meaningful change that’s already occurring in practice. The Self-Directed Performance Improvement Project pathway is now available through your ABFM Physician Portfolio and it allows practices with 1-10 physicians to report customized improvement projects specific to their practice environment, regardless of the scope of care they deliver. This pathway does not require a physician to be in a practice that has a consistent patient population or a broad scope of care. In fact, the benefit of this pathway is that it can be custom tailored to fit any practice type. The activity just needs to be focused on improving some aspect of your practice. Before beginning your project, please note the following key information about this pathway and review the sample application you will need to submit for credit after your project is completed. You may report a project you conducted alone or participated in within a single practice group, an Accountable Care Organization, or other larger group practices. You can use this pathway whether you see patients in a continuity setting, or if you are providing non-continuity episodic care (e.g., hospitalist, telemedicine, locums, urgent care, emergency department, etc.). If you have already done a project, or are currently doing a PI activity in your practice, the process requires simply completing a short, online form available in your ABFM Physician Portfolio describing the activity. Estimated completion time of the form is 15 minutes if you have all the information at hand. If you have not yet started, but are planning, a PI activity, please reference the sample application. This will tell you exactly what steps you will need to take to help ensure your project is eligible for approval by the ABFM before beginning. The individual pathway is for reporting of activities for 1-10 physicians. The ABFM will walk you through the steps to report credit for multiple physicians using a group code. The initial application is estimated to take 15 minutes to complete. Those subsequent physicians claiming credit using the group code should take approximately 5 minutes to complete. Your annual certification fee covers the cost of this activity. ABFM review and approval takes approximately 1 week. For more information, visit the ABFM website or view the Fall 2018 issue of The Phoenix. Similar to the Self-Directed Performance Improvement Activity, the ABFM has also created the Organizational Performance Improvement Pathway to allow groups of more than 10 physicians a way to track, report, and claim credit together for their customized, ongoing QI initiatives, regardless of the scope of care they deliver. Organizations, or groups of more than 10 family physicians, may apply for approval for organizational PI activities that will provide certification credit for anyone who is meaningfully participating in the effort. These projects may be ongoing, and project teams may participate at different times. A designated contact for the organization is responsible for tracking and reporting participation to the ABFM. The person reporting the data can be a non-physician team member or practice designee. The organizational pathway only costs $100 per approved PI project, regardless of the number of physicians receiving credit. For the Organizational option, visit the ABFM website for more information on how to submit group projects. ABFM’s continuous Knowledge Self-Assessment (CKSA) can help you continuously identify your personal strengths and weaknesses in medical knowledge and clinical decision-making within the framework of broad-spectrum family medicine. This is accomplished by completing 25 questions per quarter, delivered through your ABFM Physician Portfolio. Completing these can be done throughout the quarter in a manner that best suits your needs and schedule, whenever and wherever it is convenient for you. There is no passing or failing for this activity. After each question you will be given the correct answer, a critique that explains why other options were incorrect, a set of references and the option to comment on the question. This information allows you to focus subsequent CME in those areas. CKSA questions are similar in format to those seen on the certification examination. Once you have completed 100 questions over four quarters, you will receive a performance report that will estimate your probability of passing the certification examination, along with your likely score. After successful completion of each quarter, you will earn 2.5 certification points and 2.5 CME credits. If you participate in four quarters of CKSA you will earn 10 certification points, satisfying your minimum KSA requirement for that stage. For more information, visit the ABFM website. In January 2019, the ABFM launched a pilot program to assess the value and feasibility of a longitudinal assessment option to the 10-year secure examination. Limited to ABFM Diplomates who are currently certified and are in the 10th year of certification due to end Tuesday, December 31, this approach is more aligned with adult learning principles, and when coupled with modern technology, promotes more enduring learning, retention, and transfer of knowledge than episodic examinations. Pilot participants will answer up to 25 questions online quarterly in lieu of the one-day exam. You may answer questions at anytime and may use clinical references during the assessment. To satisfy your exam requirements, you will need to answer 300 questions over a four-year period and achieve a passing score. ABFM Diplomates started opting into the ABFM’s FMCLA pilot on December 7, 2018. The last day Diplomates could apply for the pilot was March 1. For more information and to check your eligibility, visit the ABFM website. The Core Content Review of Family Medicine is a joint production of the Connecticut and Ohio Academies of Family Physicians. The material is authored by a national faculty of physicians and other healthcare professionals. The faculty incorporates a wide spectrum of clinical, research, teaching, and administrative experience into the material. 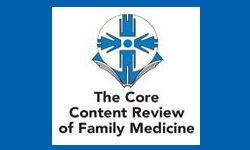 An evidence-based approach to clinical topics is emphasized throughout the writing and editing of The Core Content Review of Family Medicine. All material is peer-reviewed prior to publication.